MEMPHIS, Tenn. ­– Memphis College of Art will present two exhibitions of rarely seen work by Edward Perry this month. Edward Perry: Constructions will be on view in the Alumni Gallery in Rust Hall, Overton Park from Aug. 15–Oct. 3 with an opening reception on Saturday, Sept. 6, 5:30–8:30 p.m. Edward Perry: Between Canvas & Frame opens Aug. 20 in the Hyde Gallery, 477 S. Main, and runs through Sept. 19 with a reception on Friday, Aug. 29, 6–9 p.m.
Perry graduated from Memphis Academy of Art (now MCA) in 1972 with a BFA in Painting. While a student at MAA, Perry also took classes in physics at Southwestern (now Rhodes College) and developed a particular aptitude with lasers. He went on to study at the University of Louisville, MIT and the University of Cincinnati, where he received his MFA in 1975. Perry also worked in laser laboratories at the University of Louisville and the University of Cincinnati Medical Center under laser medicine pioneer, Dr. Leon Goldman. His work brought him into contact with laser artist Rockne Krebs with whom he worked frequently during the 1970’s. In the early 1980’s, Perry moved to Washington, D.C., living and working in a building owned by Krebs and painter Sam Gilliam. There, Perry began the work that would lead to the constructions included in the MCA exhibitions. Perry left Washington in the mid-1980’s, moving back to his parents’ farm and, later, his own house in rural Kentucky. From that time until his death in 2007, Perry worked obsessively, making paintings, sculptures, conceptual art, highly political mail art, fish and duck decoys, birdhouses, weathervanes, model boats and the works featured in Constructions and Between Canvas & Frame. Perry worked in isolation, refusing to exhibit his work. After his death, his work was left to his friend, Memphis singer/songwriter Keith Sykes and Sykes’ wife, Jerene. Since they were boxed up, Sykes had not seen the majority of the work until Mark and Betty Askew convinced him to hang the work at their architectural firm, A2H, in Lakeland in 2012. Brought to the attention of MCA Dean Remy Miller and Professor Ellen Daugherty, Perry’s work became the subject of a class taught by Dr. Daugherty in the spring 2014 semester that has done much primary research about the work and the artist. 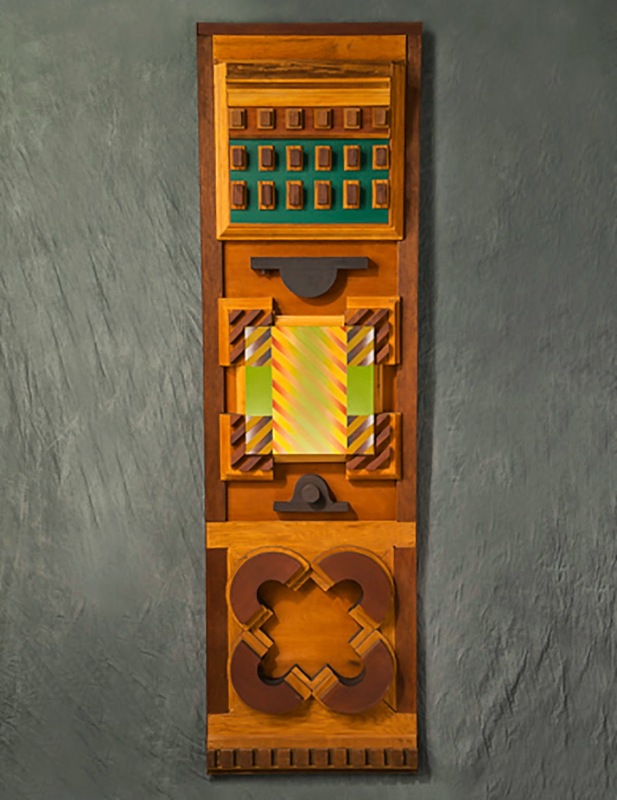 The works are large, intricate wooden constructions encompassing small paintings on canvas or, in the case of a few of Perry’s creations, electronic circuit boards. “The works play with the boundaries between painting and sculpture, two-and three-dimensionality, “high” art and “folk” craft, luxury materials and detritus, abstraction and figuration, solids and voids, and the image on a canvas and its surrounding frame,” said Daugherty. Read about this show plus an interview with Amy here.